Thread: how to quilt log cabin? 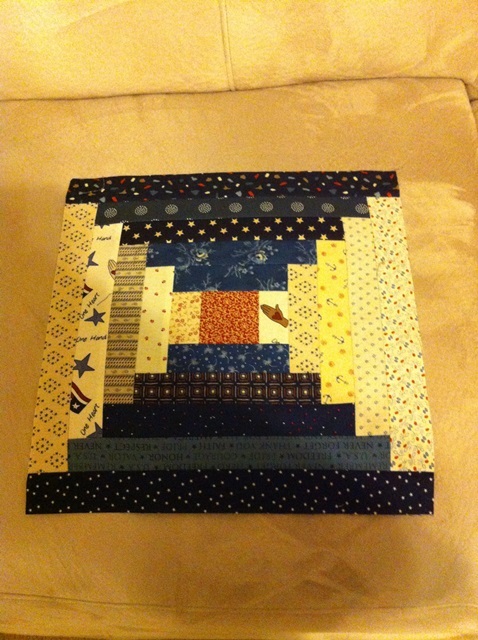 How would you quilt this log cabin block? There will be 5 of them in a table runner. Very pretty. It looks like a courthouse steps to me. Love the colors. I have quilted some my log cabin quilts with STID and some with free-motion quilting. Both methods turned out great! If it has a lot of straight lines in the piecing, I prefer curvy quilting like baptist fan or loopy stippling. I'm a feather fanatic so that'd be my first choice! I made a log cabin years ago with a feather in each the dark and light part of the block. I think this is the "court house steps" version, you could google "quilting log cabin quilt" or "quilt designs court house steps quilt" and see what comes up! I get so many ideas just looking up on Google then clicking on "images". Can't wait to see what you do! That's how I would like to quilt my LCQ. Mine is a LCQ with sashing; blocks are 12-inches square. It's also batik and scrappy--no light/dark patterns except for random balance of individual pieces. It's very bright and colorful. I am terrible at Stitch in the Ditch. Honestly, any all over quilting works well. Bishop's curve is a good idea. If you want to keep it sweet and simple, log cabins are really tailor made for STID. How about a spider web design. It's fairly traditional for log cabin blocks and would suit your courthouse steps perfectly using both straight lines and curves in the quilting. has a lovely quilting pattern. Scroll down to see it up close. As others have said, that is Courthouse Steps, a variation of Log Cabin. I have Stitched in the Ditch, echo quilted, put a huge flower pattern in the middle of each block, put feathers in each half of the block, it all works. That is the nice part of these simple strip made blocks. You can do almost anything to them and have them work. I agree with BrendaK and offer my apology for mentioning the block name discrepency in my prior post. In the grand scheme of things it makes no difference at all what the block is called. Your fabric choices and colors are gorgeous and the block is perfectly made. Job well done! No reason to apologize. The more we know, the more we know. The block is Courthouse Steps. It IS a variation of Log Cabin. But... it is not Log Cabin. What she said! I'm interested too cause I have the basics quilted but I need something for the lighter part.